**** Chosen by Winner: Noel M.
The Kizer Megatherium features a dramatic Elijah Isham design that will be a stand out in any collection. Elijah has a strong appreciation for surreal art, resulting in unique and creative knife designs that function as good as they look. This model has a modified wharncliffe blade made from CPM-S35VN steel and a titanium frame lock handle with a black tumbled finish. 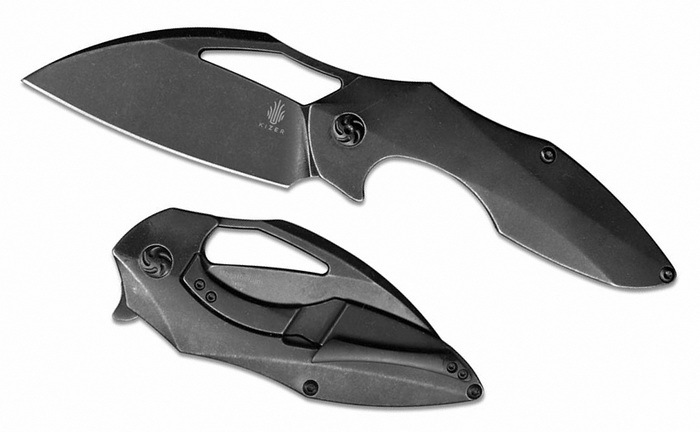 The Megatherium comes equipped with Isham's "Edge Below Tab" flipper system, that conceals the flipper in the open position for unobstructed performance. Item includes a titanium tip-up pocket clip with a bead blast finish.